Alvaston seems a distant memory now – although it has only been about 3 months since it was all completed we never managed to get some shots up of the central reservation piece Treeline. We really had to work hard with the overall with the design of this and involved a combination of practical and the aesthetic solutions to the project. 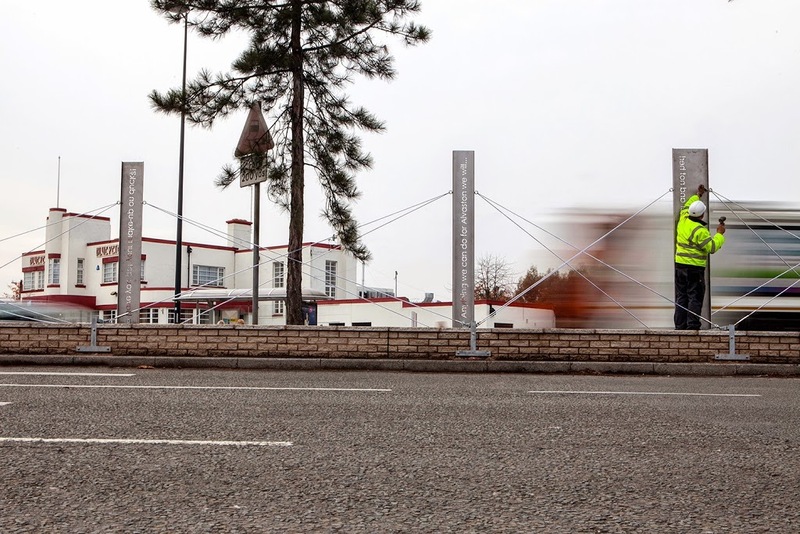 The artwork was first and foremost designed for pedestrians and retailers on Shardlow Road. It needed to be visible from both sides of the road – to be “open” and not block the view. Another practical issue was to make it light but also be a visual deterrent to anyone wanting to cross the dual carriageway somewhere other than the pedestrian crossing (its such a short piece of road not sure why anyone would try…) The other visual practicality we had to take into consideration was for drivers. 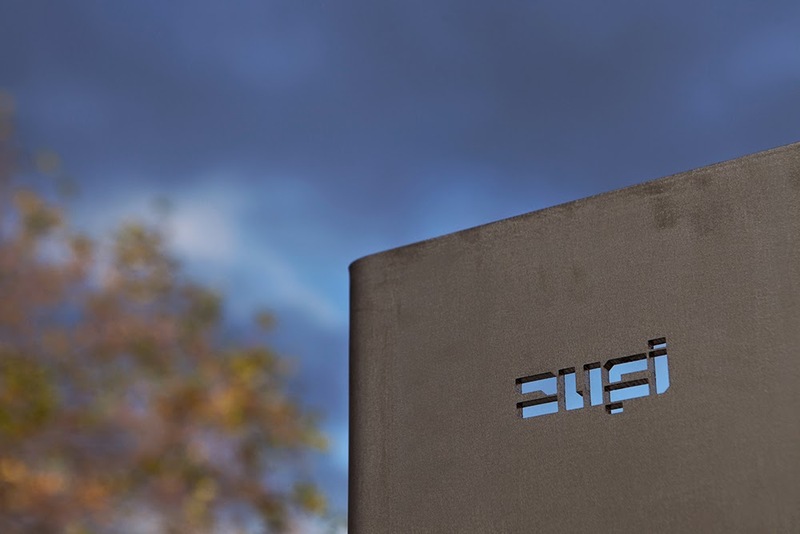 With the artwork sitting on a central reservation in a built up urban area we needed this to not be too distracting for drivers and our original idea to use polished steel was changed to a milled flatter finish. 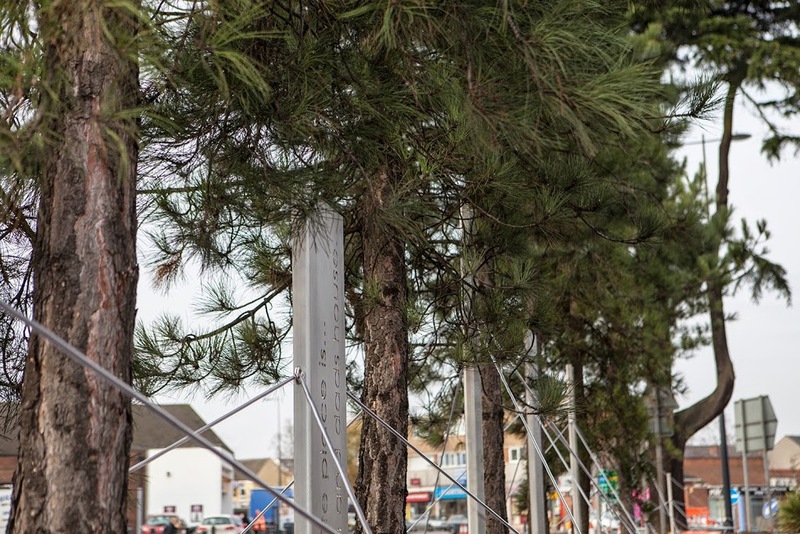 The artworks also run along the central reservation as opposed to perpendicular – that helped emphasise the fact this was for pedestrians and not drivers. 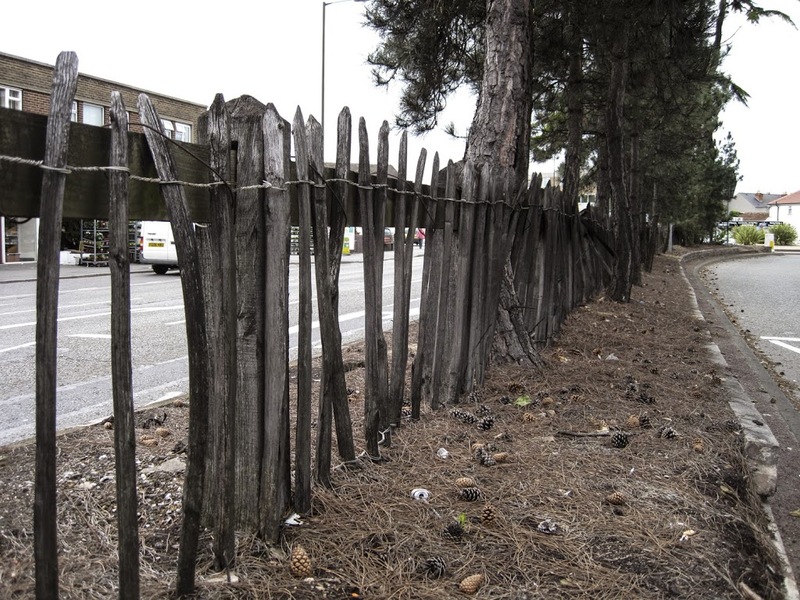 We had a practical issue to address as well as the central reservation had a row of mixed pine and fir trees of varying sizes – some more robust than others. A number of these were removed as part of a thinning out programme and we replaced each of these trees with one of our text uprights. Text on these came from the consultation we did with the community and ties in with the column Honest & Down To Earth Part I. The works could not break into ground within 2m of each tree trunk to stop damage to root systems. This made it completely impossible to ground the artwork within the central reservation. With the help of our long suffering and patient engineers Wallace Stone we developed a cross-brace and cabling system that helped to solve this challenge! It was a long process but we are happy with the outcome. 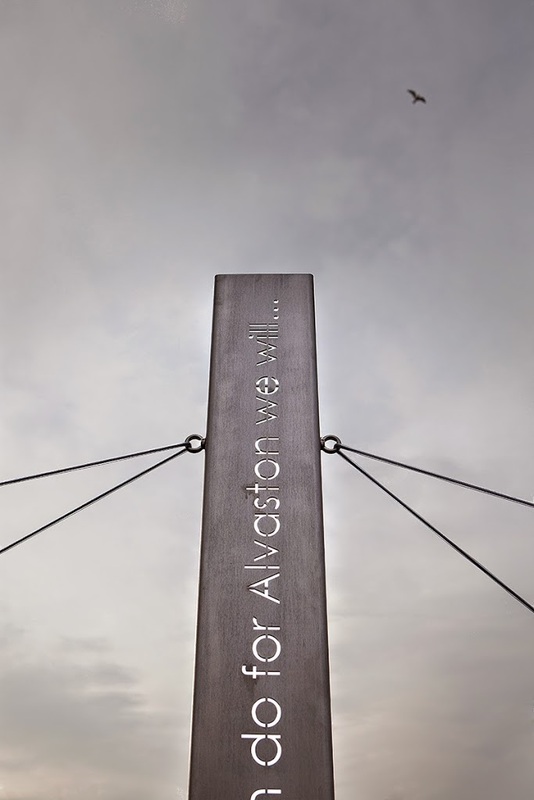 Alvaston (and Derby) has changed dramatically from being an East Midland mill town to one of the leading centres of advanced engineering so with our choice of stainless steel we hope helped to represent the future of the city. The guys at MCE Engineering in Derby worked with us on fabrication of this artwork and they were perfectly professional and a great group of guys to work with. A special thanks goes to Tony and Steve for all their efforts for going above and beyond with what we expected them to do and coming up with very practical solutions along the way. From Derby City Council we really have to thanks Helen Acton (who has been there every step of the way…apart from when she broke her leg! ), Vince Taylor, Andy Smart and Steve Slaney who was the onsite Clerk of Works. Also a big thanks to the guys at Eurovia – especially site foreman Mick – what a star!